We are so very grateful to the many artists who have contributed a cover of one of Sky's songs to this album. We are just overjoyed that this album has taken on a life of its own, it seems. This tribute album will be a retrospective of Sky's entire career; not just his Seeds career, so you will be hearing covers of songs from his Little Richie Marsh days through his later albums and some unreleased songs as well. To your left is just a sample of what is in store on this album. Here are The Electric Prunes covering Pushin' Too Hard with an amazing video by Marc Rubenstein of Pig Light Show! Titles considered so far for the album: Reach For The Sky! or Sky's the Limit! or Sunlight in the Sky! or Sowing Seeds of Sky! 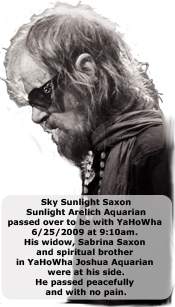 Sky Sunlight Saxon, I believe, is one of the most prolific artists of all time. As we release more and more of his music, you will come to believe this as well. This album's profits will go toward two resting places for Sky's ashes. First and foremost, I (or someone I appoint) will fly to Hawaii and meet with Sky's spiritual family and scatter his ashes in the area where his spiritual father's ashes are spread. For those of you who do not know Sky was very deeply involved with his spiritual Family (The Source Family), and Father Yod was the spiritual father of that family. Father Yod died in a hang gliding accident in 1975 but Sky was a devoted spiritual son of his. Many of you who may have seen Sky in concert will remember Sky talking about YaHoWha ... this is from his spiritual family teachings. If you are interested to know more about the Source Family please visit their website at www.yahowha.org .... For Sky's ashes to be scattered in the very area where Father Yod's ashes were scattered is first and foremost, Sky's wishes. Secondly, due to requests from fans for a place they can visit and show their respects, we will purchase a space in the Hollywood Forever Cemetary. Please find to your right a video with the cover of Sky's song from his Atlantic Rising album, The World is Spinning Around. Many of you may have never heard Sky's original version of this. But here you can hear Lostdog in Loveland's cover of it for this tribute album. Robert Mag of Lostdog in Loveland made this beautiful video to go with the song. Their cover features Mike Garson, David Bowie's pianist. Enjoy! Also, just below please find Merrell Fankhauser's video of the song he wrote for this tribute album called Two Guys From the Sixties ... such a cute heartfelt song with great photos of Sky and Merrell. Merrell is joined by Ed Cassidy from Spirit on the drums and Eric Britain on fiddle. Enjoy ! Next please find Sleepyard's cover of Chocolate River. 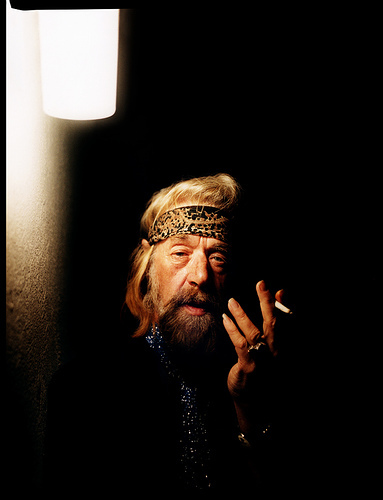 Sleepyard is a project of Oliver Kerspergen of Norway with Nik Turner on Saxophone, Richard Formby on Bass and Drums, Knut Jonas Sellevold on Mellotron and Gaute Storsve on Guitar. Enjoy! We are still waiting on confirmation from other artists and bands and will update soon. If you would like to submit a cover song please contact us a.s.a.p. so we can talk. You can reach me at bohemefem@gmail.com and you can reach Karl at karl@gragroup.com. This tribute album also will include bonus tracks of some of the latest Sky Sunlight Saxon music that is yet unreleased.